View a technical presentation on expansion joints right from your computer for free. We have a team of expert engineers on stand-by to answer any questions you may have during or after the presentation. U.S. Bellows, Inc. has more than 30 years of experience designing and manufacturing expansion joints, along with replacement and repair services. Listen to in-depth explanations on how to choose the type of expansion joint that will best suit your system. Learn about the bellows movements throughout the piping system due to thermal changes of mechanical motion. Increase your understanding of the different types of expansion joints and value-added services offered by U.S. Bellows. We look forward to having you join us for this complimentary presentation. What’s in a Refractory-lined Expansion Joint? 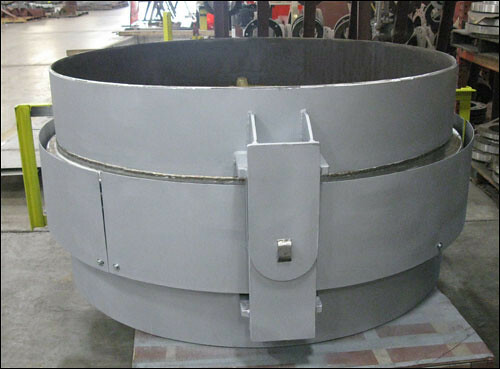 U.S. Bellows created a model cut-out section of a refractory-lined FCCU expansion joint for flue gas or catalysts service. U.S. Bellows can bring this model to your facility for a lunch and learn: contact our team for assistance. We recently introduced a new Expansion Joint Frequently Asked Questions section on our website. This new database of questions provides the answers to a lot of common questions regarding metallic expansion joints, fabric expansion joints, expansion joint testing, and more! The list of questions is continually expanding, so check back often for more valuable expansion joint information. This single hinged expansion joint is designed for sulphur dioxide service in a sulphuric acid plant. It was fabricated with 321 stainless steel bellows and liner, and A-516 GR 70 carbon steel hinge plates and pipe. The pipe is 66″ outside diameter and 35-1/4″ overall length. The expansion joint was designed for 6° angular and 3 PSIG at 680°F. The bellows and pipe long seams were 100% x-rayed, and all the welds were 100% dye penetrant tested. A soap and air test at 15 PSIG was conducted prior to shipment. Hinges permit angular rotation in one plane only by the use of a pair of pins through hinge plates attached to the expansion joint ends. Hinges and hinge pins are designed to restrain the thrust of the expansion joint due to internal pressure. Hinges can also be designed to carry piping loads, if specified. Pressure relief safety valves are designed to control steam pressure. This prevents over pressurization, which can result in serious accidents and costly damage to equipment. When the relief valve operates, there is a steam flow. During venting of the pressure, the steam is discharged to the atmosphere using an open system that could cause blow-back. The safe answer to open venting is a closed sealed venting system. The closed system eliminates steam blow-back and hazard conditions for the employees. The closed venting system uses a bellows type safety valve connector. U.S. Bellows offers a wide range of pressure relief safety valve connections. Shown below are externally pressurized safety valve connectors for a power generation company in Wisconsin. These 15 pressure relief safety valve connector expansion joints were manufactured from 316SS, A-335 P22, A-387 Gr22, A106, and A-516-70. They were externally pressurized to prevent steam blow back, and will be attached to the relief valves in a power plant. The expansion joints will assist in maintaining pressure as well as provide for 7″ axial and 6″ lateral travel. They can handle applicable loads of up to 150 PSIG at 535°F and 460 PSIG at 885°F, but can function if temperatures reach 1,000°F. They range from 30″ to 85″ in length and weigh between 400 lb. and 1,600 lb. Dye penetrate, air, and soap bubble tests were completed for quality and performance assurance.